After several decades, Disney finally rolls out a sequel to their popular family film. 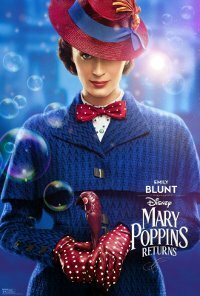 Set in Depression-era London, a now-grown Jane and Michael Banks, along with Michael’s three children, are visited by the enigmatic Mary Poppins following a personal loss. Through her unique magical skills, and with the aid of her friend Jack, she helps the family rediscover the joy and wonder missing in their lives. This film is releasing in 2D, IMAX and 4DX. This is the 2D version. My umbrella never lets me down. Language Infrequent and very low impact langauge elements that are fleeting. Parental Guidance is advised. Comments Infrequent and Low impact Violence is noticed mainly in an emotional context. The V advisory is recommended for senitive viewers for Parents and Care-givers to be informed that there are grey areas and they might have to allay fears and be of reassurance. 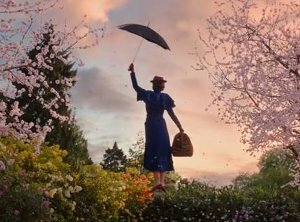 However, it must be noted that any moments of darkness or emotional violence are very quickly skirted over as the magical qualities of Mary Poppins and her positive magically enhanced spirit transport the viewer into a colourful, magical, unrealistic fantasy world.